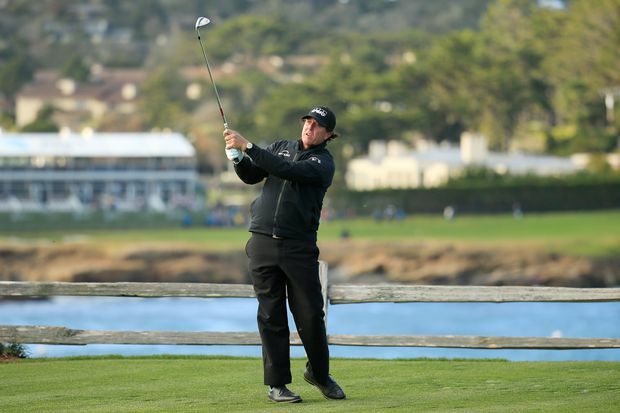 Phil Mickelson plays a shot from the seventh tee during the final round of the AT&T Pebble Beach Pro-Am at Pebble Beach Golf Links on Feb. 10, 2019. A Monday finish brought on by rain and a freak hailstorm was only a minor inconvenience for the 48-year-old Mickelson. He played two holes just as well as the previous 16 and polished off his bogey-free final round with one last birdie for a 7-under 65 and a three-shot victory over Paul Casey in the AT&T Pebble Beach Pro-Am. How it bodes for the rest of the year – particularly in June when the U.S. Open returns to Pebble Beach – was of little concern to Mickelson. The U.S. Open remains the final piece of the career Grand Slam for Mickelson, who already holds the record with six runner-up finishes. He finished three shots behind Graeme McDowell in 2010, the last U.S. Open at Pebble.